Hi Mogami and welcome to the forum. There are 3 parts of the mod, KS Sprites, KS Supplemental Maps and KS Napoleon Mod. The links are all colored blue. You have to be logged in for them to become active. The keyboard.csv file is found in My Documents\SOWWL. If it is not there, you should have one named defaultkeys.csv. You can rename that to keyboard.csv. We play several times a week. The days and times are announced on the forum. We will likely have a game Wednesday. The announcement will be in the Impromptu Games thread. You are of course welcome to join us and can have a command of any size you are comfortable with. Hi Mogami and welcome. We look forward to seeing you on the battlefield. In addition to Billy's comments you'll need to download and install Teamspeak and have a mic. There is no pause option in multi-player. Hi. I was wondering if there is any way to download this mod from another source? The Dropbox download time goes up to 1 day and then stops to download at all. Depending on your download speed, it should take ~10 minutes to download the largest file, the KS Sprites. The others should be faster. I'd suggest trying again. I live in Costa Rica and I find that the best time to download the KS Mods are over night or anything else from drop box. What takes most people 10 minutes takes me 40+, even then I have to sometimes re download the file because the download was bad. These mods will NOT work. I have extracted them to the Mods folder in the SoWW directory - marked them in the Modifications menu inside the game and restarted. While the mods are still marked, there is no change. Nothing is showing up in the scenarios or sandbox. The actual mod folder is inside the mod folder you extracted. Same name. Example: a folder gets extracted that is called "KS Mod". Inside that folder is a single folder of the same name "KS Mod" but with all the files in it. The latter folder is the one that gets dropped in the SOWWL mods folder. I had same issue until Moresy corrected me ... so just to be safe I personally first extract it to a folder on my desktop. I Open that folder and drag. Awesome, thanks. Got it working. I have a question though regarding the OOB. Me and my friend are attempting to play Army vs Army against the French. When I am in the Multiplayer Lobby looking at OOB's I pick say the 00B_SB_StockFullFrench. I say to myself, awesome, I'll play wellington and he can play Blucher which would separate the army roughly in half between us. But, when I select that and go back to the room where you can select commanders it looks completely different. The OOB isn't even the same. That is a question for Martin, Kevin and others. Glad you got it working! First, welcome to the forum. How is it different? I just tried that OOB in an MP sandbox and saw the commanders in that OOB. I've included pictures of what I see. It is completely different the OOB. The lettering is too small. I can't read it. Sorry, I turned down my resolution so that you can read it. Are you using any other mods besides the three KS mods? No, I am not. Even when just doing Vanilla with nothing else turned on "except for Full French" I get the exact same thing. Here is a Different OOB and I get the exact same thing. All of my OOB's do this, Vanilla or Mod. I see the problem now. 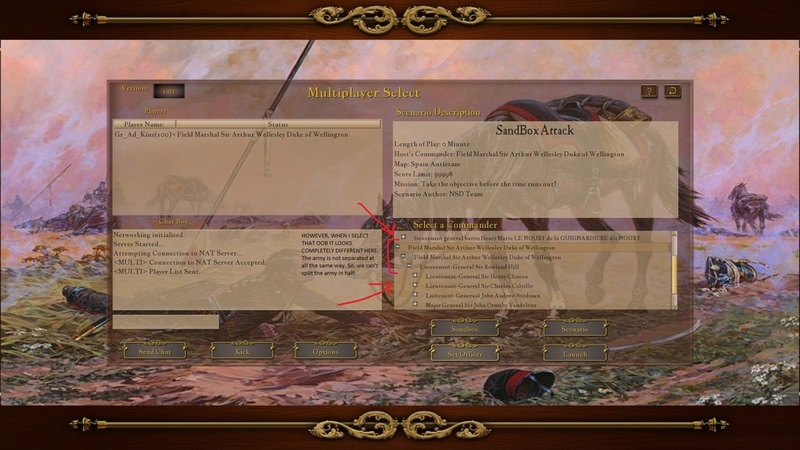 When you choose an attack or defend sandbox scenario, the game automatically limits the size of each army and randomly decides which corps to use. Hunt Them Down and Line of Sight are the only scenarios which utilize the entire OOB. It's a shortcoming that can't be modded away. That was it. Thanks. Was scratching my head trying to figure it out. What's the difference between hunt them down and line of sight? In Line of Sight, the enemy is lined up in front of you and very close. He won't move until you come in visual range. In Hunt Them Down, you are usually on the opposite side of the map. The enemy will deploy his divisions in a random fashion over the map. Hi. I finally managed to download all the 3 part of the mod. And now I have a problem with getting it to work. I unpacked all the 3 files in the Mods folder, started the game, turned the mods on, resigned. After I launch the game nothing happens. A common issue here is that unzipped mod files often have an extra tier (folder) as a result of the unzipping process. This means that there is often a folder inside the mod folder with the same name. If this is the issue, then all you have to do is take drag the inner folder out and delete the outer folder. Hope this makes sense. Please report back to us what you think. I disliked this mod at first. For some reason my expectations were really high. After playing it some more time, I grew to think it's not that bad, though still disliking it.I played SOW:GB demo, and didn't enjoy it, so I was hesitant as to whether I should buy Waterloo. I found Waterloo different, and I liked it. However this mod feels a lot like Gettysburg. I dislike the interface and the flags above the units that blend in with the environment, making it quite hard to find and click on. First thing I did when I launched KS, is I started playing russian scenario, maybe that's what gave me the bad initial impression. First thing I noticed is that musketeers and grenadiers have the same sprites wearing Semenovski lifeguard uniform and playing Preobrazhensky guard march. At that point I was really disappointed. I tried different scenarios, but couldn't check the rest of this mod's features because after joining the field as a division commander and receiving my orders, I march to the objective all alone, finally meeting the enemy corps and getting obliterated from their artillery fire and numbers superiority. Which leaves me confused, just like Gettysburg did. I've also encountered some bugs. The first one won't let me do any actions after giving a movement order to my unit. It gets fixed after clicking the left mouse button, but I have to do it every time after giving a movemnt order. The second one makes some scenarios unplayable, because of an error saying it couldn't find the map. You need to go into Options and disable the context menus, that gets rid of the necessary "screen click". This isn't an issue with the mod, but the way Waterloo's user interface is set up. This is an instruction to do this in the post where the mod download link is. There are several maps that will only work if you also have Gettysburg and move the map .lsl files into the shell folder that comes with the Supplemental maps Mod. This is also described in the Mod and you could have missed it. Or you may have used a map that is not configured to work correctly with Waterloo. Please use only those maps that begin with a country name. Anything that does not start with a country name or begins with "ACW" is not compatible. Bear in mind that Gettysburg and Waterloo are exactly the same game apart from a few changes that were introduced with Waterloo that involved skirmishers, square and cavalry logic, and fortified buildings. 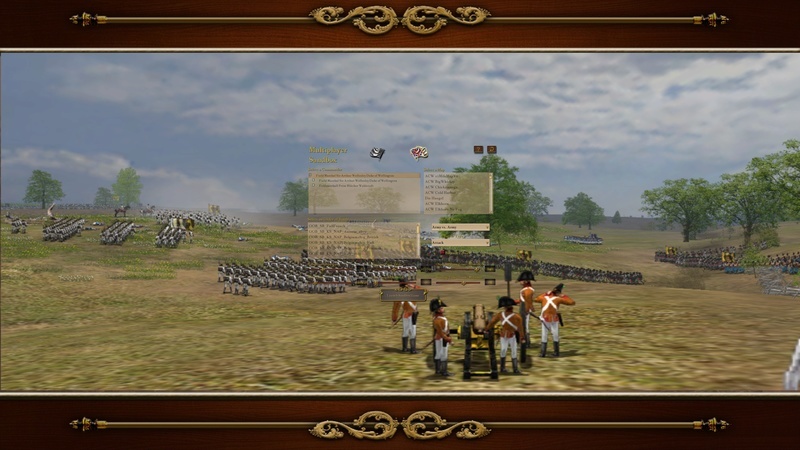 Our mod does not use the styling of the Waterloo toolbar but the Gettysburg one because most of our members played that game for years using a Napoleonic mod and we are used to it. 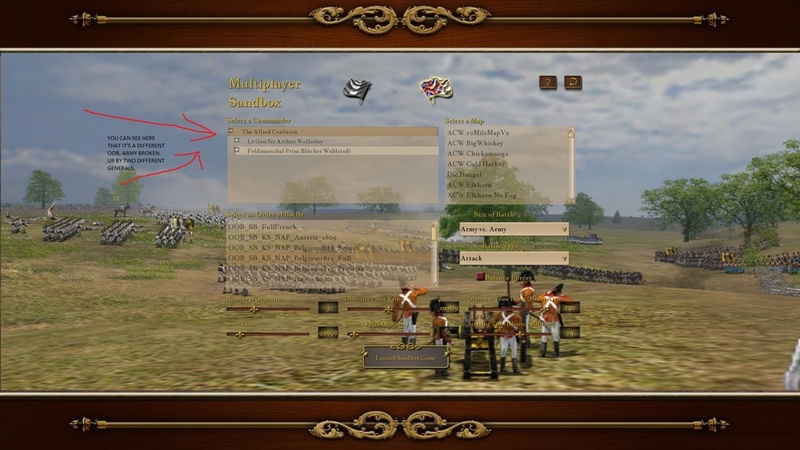 When we all bought Waterloo we were appalled at how terrible the 'updated' interface was, especially for HITS play. We all hated it! We reworked it back to what we were familiar with as much as we could. Its simpler, clearer and we feel has a more logical layout. I personally would prefer more subdued button graphics but that's something for the future possibly. Can you be specific about the Russian sprites? Was this the 1807 OOB or 1812? I am not an expert on the Napoleonic Russian army so can't comment on their uniforms. Given the host of errors in the default game's sprites and flags I was surprised to read your comments. The game uses only two or three pieces of marching music per army - we could add more, say one for each sprite type, but this is 1) a lot of work and 2) would use up game memory better used elsewhere. Getting super appropriate music is low down on our list of priorities but if people can find and offer us better music of a suitable file size and sample rate we would be happy to include it. As to how strong the artillery is, you have probably been led into believing by the stock game that Napoleonic artillery was not very powerful. The stock artillery effect is lifted directly from Gettysburg and it was woefully underpowered there. Given that Napoleonic artillery caused a higher percentage of losses than ACW artillery did, we knew there was something wrong. The artillery power in the stock game is extremely unrealistic and weak. 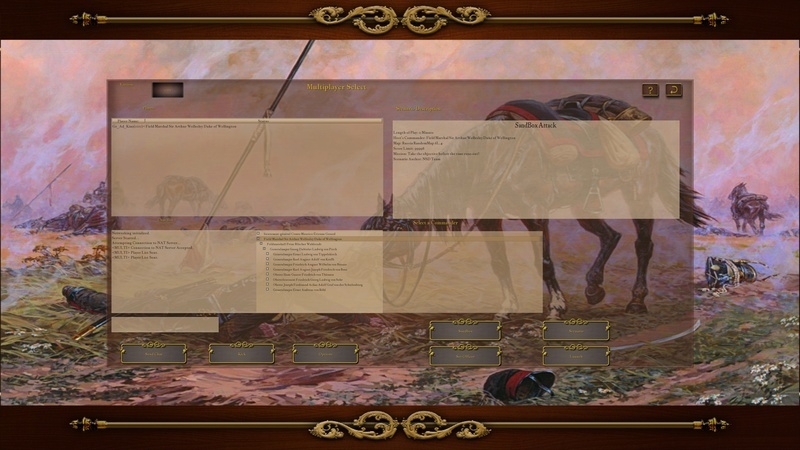 We undertook a study of casualty statistics from many Napoleonic battles with wounds and losses caused by all arms and with months of playtesting slowly got the mod to behave (in terms of casualties) much closer to what the records tell us Napoleonic combat was like. Artillery dominated the Napoleonic battlefield when it was well sited and supported and an opponent chose to advance through its fire zones. Its as simple as that. We've adjusted very many other factors, completely redesigned how significant skirmisher fire is and how they work (the stock ones are completely useless of course and have no effect on combat other than giving cavalry something to run over). I suspect you feel the game is more like Gettysburg because of the interface and that is deliberate but the KS Mod is very unlike either Waterloo or Gettysburg in how it plays and what tactics you need to employ to win - you've already discovered that advancing frontally against artillery is suicide so you need to counter that by some means; avoiding a direct approach or employing you own guns in counter-battery fire are both options. I hope you persevere with the game. We have worked on it for years and are all very proud of it and what a different game it gives from the stock experience. You're welcome to try MP with us - player vs player is where the game really shines though be aware we use the highest fog of war settings the game allows and we know this doesn't appeal to everyone. Either way, thank you very much for downloading the mod and giving it a try.